Today is June 1. The start of a new month, the last month of school. the official start of summer. Today is also the one month countdown to July 1. 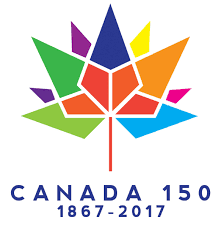 On July 1, 2017 Canada- my beloved country- will be turning 150. Canada, as a country, is still pretty young and we have done a lot in our 150 years. 2017 has been- and will continue to be- a year long celebration. On Canada Day, I will be in my hometown celebrating this milestone. There are some fun things planned and I'm excited to participate and be part of the celebration. I will be sure to share the day via Instagram, and (eventually) here, on the blog. From coast to coast to coast, there are so many different things planned to celebrate Canada 150. There are too many great things happening to list, but I wanted to share a couple of my favourites. ParticipACTION has created a list 150 activities to get people moving. What I like about this list is that the items have been selected because they represent Canada and Canadians. Hudson's Bay, a truly iconic and Canadian company, is doing the Grand Portage. This is a limited edition collection, where proceeds were go toward completing the last 2,200 kilometers of the Great Trail. The Great Trial, is a cross-Canada network of recreational hiking trails. They are literally connecting all Canadians. The Canadian Government has gifted Canadians with a Parks Canada pass. This gives Canadians free admission to all National Parks, National Historic Sites, and National Marine Conservation Areas. I have already visited Fort George in Niagara-on-the-Lake and I'm hoping to use my pass to visit Laurier House in Ottawa later this week, and I'm planning a trip with a friend to Peelee Island in early June. I'm looking forward to exploring. I have also been selected by the National Ballet of Canada to participate in their 150 Pointes project. I was so surprised, and honoured, to be selected! I'm working with a couple of different people to really showcase my 'pointe' in Canada. There are so many fun, interesting, and cool things going on. I'm really trying to embrace and experience as much as I can.